The Queen Saovabha Memorial Institute in Bangkok raises venomous snakes for the purpose of producing antivenom. The antidote is highly specific to the species that bites you, and there are plenty of venomous snakes endemic to Thailand. Consequently, in the 1920s King Rama VI offered land and support for this institute to research and develop antivenoms to save lives. 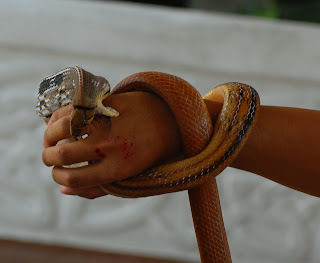 The handler giving this demonstration (involving an aggressive but fortunately nonvenomous species) misjudged the snake's reach, and was bitten a few times. Ouch!